With some Euphorbia and Alchemilla, and a single strand of Fennel, this peony stands out even better. A surprise parcel arrived this morning – a handmade beaded glass cover from my sweet and talented sister! I think it’s beautiful, and wish I was able to make things like this. We finally have blue skies again today, so finding a photo spot was not as tricky as last week! Hope you have a sunny week, and why not take a look at some of the other In a Vase on Monday posts which are linked on Cathy’s page at Rambling in the Garden. This entry was posted in Garden, In a Vase on Monday, Plants and tagged Cut Flowers, Garden. Bookmark the permalink. Thanks Dana. I must admit I am always hesitant to cut my peonies, but with a hot spell forecast for the next few days this one might last better in a vase! I do often bring in the fragranced ones though as they spoil so easily and the scent in the house is wonderful! Enjoy your peony too! You are brave cutting a peony, their life is so short, even in the garden. The acid colours of the euphorbias and Alchemilla work wonderfully with the colour of the peony. Your day is much sunnier than ours. Have a wonderful holiday Susan – I think May must be a lovely time to travel through France. What a lovely meme Cathy and beautifully done by you too. Thanks Claire. Perhaps you can join in one week. It has opened my eyes to just how much there is out there worth bringing in to the house to enjoy! You have taken so beautiful pictures of the vase and your sister´s surprise. I get summer feelings. 🙂 In the evening the High pressure syterm reached Northern Germany! Very nice job creating a contrasting setting for the beautiful red peony. Thank you Jason. 🙂 The Euphorbia is looking so good this spring, and seems to be spreading nicely too. 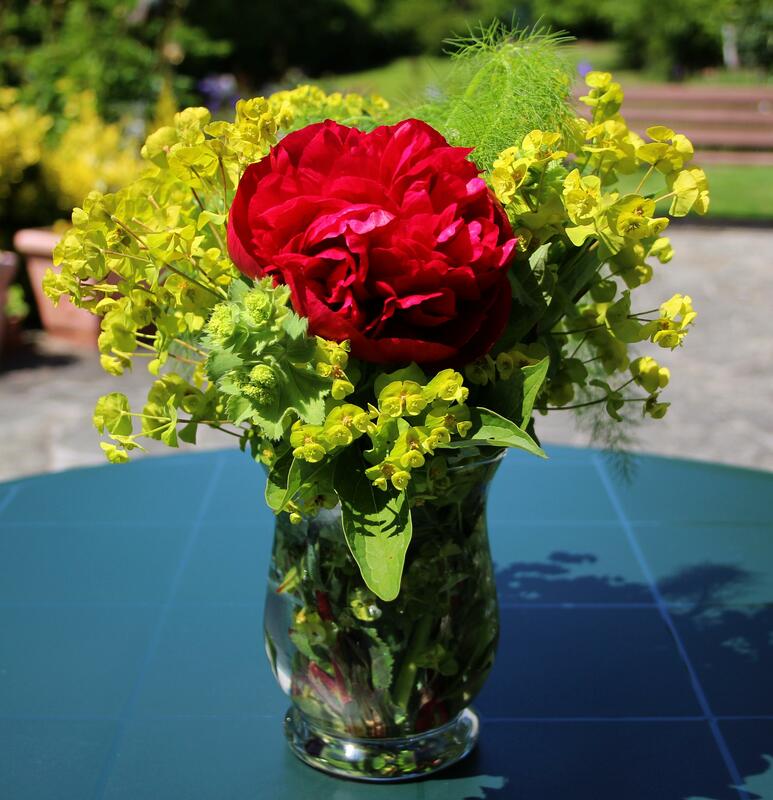 Your red peony works perfectly with the chartreuse foliage. I love this–sort of a modern look. (I used peonies today also). Your blue sky is glorious–enjoy. Thanks Susie. I really love this Euphorbia, and the Alchemilla flowers are sure to open this week too. I like your word for the colour – chartreuse – perfect! Oh dear, I have peony envy again. It is so enjoyable, so I do hope you can join in one week… it has got me looking at my garden much more carefully! Beautiful display. I am intrigued with the glass cover your sister made. How lovely. I have never seen anything like it. Isn’t it pretty! And such a good idea for summer drinks. It’s too nice to use really! LOL! 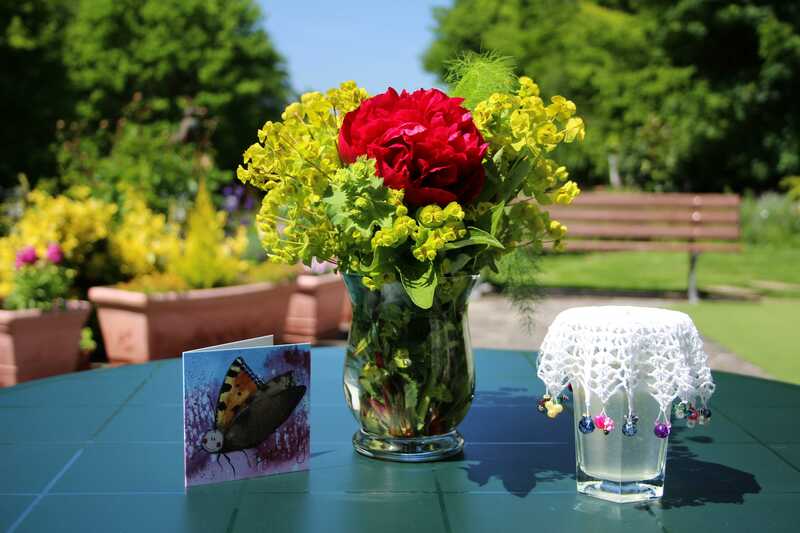 Lovely flower arrangement and so beautiful and artistic crochet-work from Susan – wonderful! Have a sunny week too, Cathy! Lovely arrangement. I adore peonies. Your sister’s glass cover is a brilliant idea for summer days in the garden. Doesn’t the red peony look great against the acid green – you have such a good eye for colour. What a great way to show off your peony. And what a clever sister, I could use something like that to protect my mugs of tea from the flies! How beautiful! Have a great week! They are fleeting aren’t they. Wouldn’t be without them though! Beautiful! 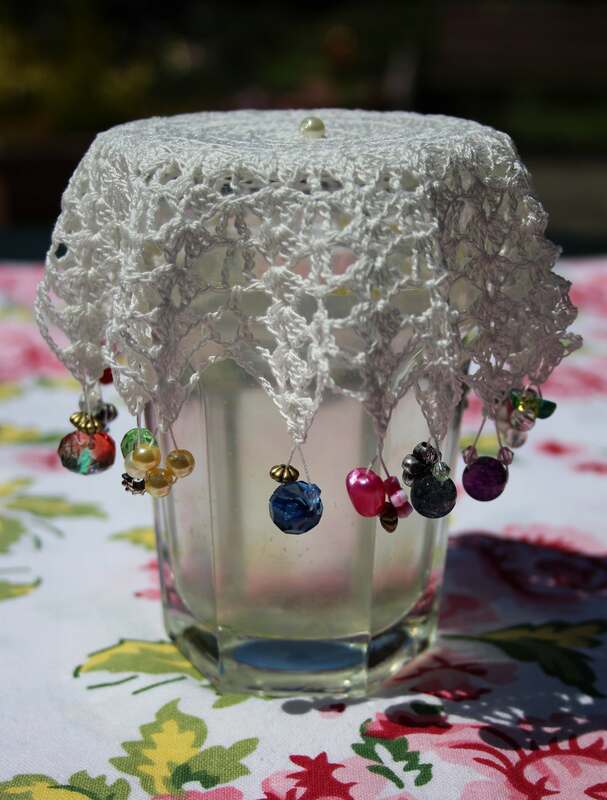 I was pleased you took a close up of the beads on the cover your sister made, little gems, so pretty. 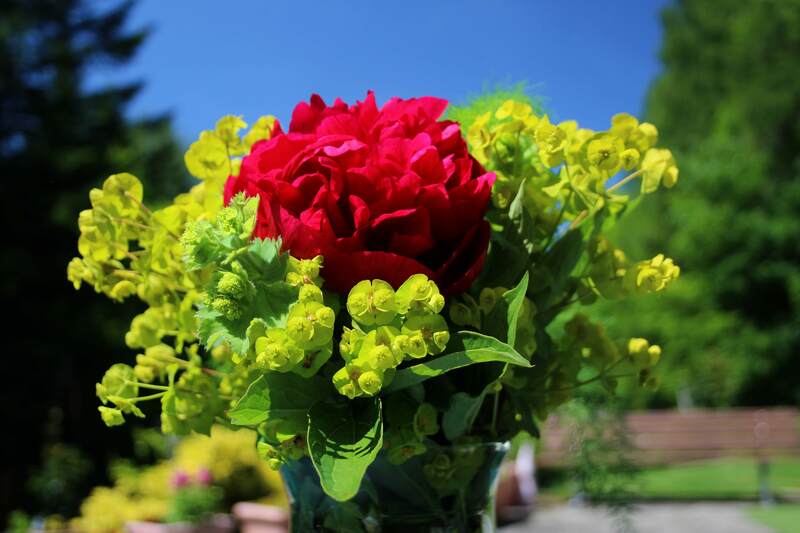 I love the contrast of the red peony with the lime of the euphorbia.D.